FINAL info on New Year's? So, who else thinks that we'll get some form of info on FINAL on on New Year's Day, like we got with 3.0 back in the beginning of 2012? Personally, I don't think it's all that impossible that we could still have a 2014 release date for FINAL. Anno himself said weeks ago that the script has been provisionally finished, so they might already be in the storyboarding/animating phase if he's not cranking out another half dozen drafts. Plus, it doesn't look like there will be another project like Kantoku Shikkaku, that will sidetrack Anno from production of NTE as it probably did with 3.0. 2) We get an international title. 3) We get a release date. Honestly, it isn't out side the REM UV PUSURBIRITY to expect some kind of info from the production. I'm kind of hoping for something, if anything at all. Hmnnmmm...... i hope for the teaser. We'll get it when we get it. Speculating about it is completely inane. Thanks to Ornette for unlock because kinda sorta bulrb of "news"! This blog post on Minna no Eva Fan is a review of 4.0 news throughout 2013. The most interesting thing about it is a quote from Tadashi Hiramatsu's blog dated Dec 29th saying he's doing some work on Final, or something like that if google is to be trusted. Not too long ago Hiramatsu's Khara Calendar bio said he "was a layout artist and key animator on Evangelion: 1.0, 2.0 and 3.0 and plans to participate in 4.0 as well". It's roughly 23.5 hours until New Year, if there is a card they're posting like the nekomimi Asuka one we should see it soon. Nah, they still have to sell all that Q merchandising for another year. Maybe I can expect new content if Q is ever aired on TV in 2014.
atarashiieva wrote: Nah, they still have to sell all that Q merchandising for another year. Toonami may air 3.0, who knows? I wouldn't put it past them to give us something on New Year's Day, perhaps a little delayed from Japan time to make it more suitable for the rest of the world. Or something. Anyway, we'll get what we'll get. Lord ikari Shinji wrote: Toonami may air 3.0, who knows? My bad, I actually meant in Japan. atarashiieva wrote: My bad, I actually meant in Japan. Any Toonami airing has no relevance here. The Japanese TV broadcasts of the movies are relevant because they've had new trailers attached to them in the past. Either way it's best to keep the speculation to a minimum right now lest this thread be locked again. The only reason it was unlocked was because of a teeny tiny blurb of something that just barely qualifes as almost news. So, we're speculating on whether or not our speculation will come true? Let's wait until the mods put up something. I'm so excited to screw-up a ton of checks over the next month. It's 8 AM over in Japan, so maybe there will be something a little later in the day. Well, I'll be keeping my eyes peeled and my expectations low. They updated the Evastore and added a new layout. 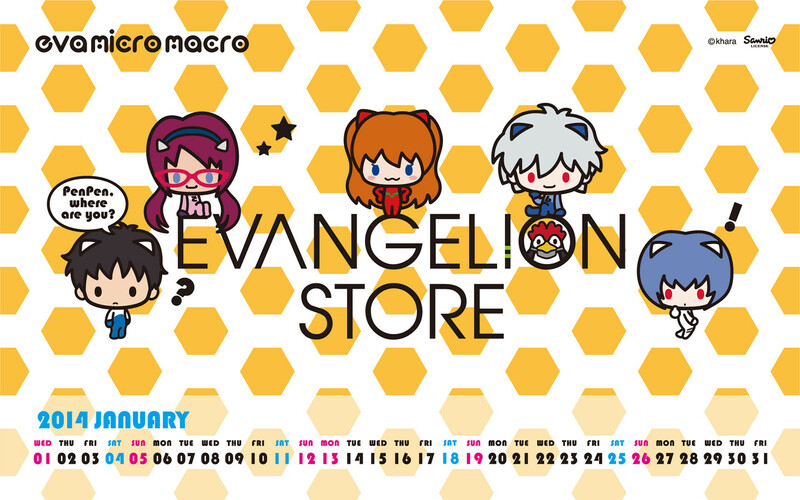 Their new wallpaper is a calender for January. I guess it's possible they won't update with anything (if Final will be out 2015 and not 2014). Hm. Very d'aww worthy. I don't think it will replace my Mutio, but I may save it to file. The Evastore changes wallpapers every month. In December they migrated Eva-T into it, but not its search functions. Haha! People thought Anno was gonna spill some sort of beans about Eva. Silly people.